UN Watch NGO urges UN member states to take action against election of human rights abusers to the UN Human Rights Council. The UN Watch non-governmental organization on Friday urged member states of the UN General Assembly to oppose the re-election this coming Wednesday of egregious human rights abusers Venezuela, Pakistan and UAE to the UN Human Rights Council (UNHRC), as well as Burundi, Ecuador, Ethiopia, Kyrgyzstan, Lao, and Togo, due to widespread criticism of these governments' violations of fundamental freedoms. "The expected election of these rights abusing regimes would deal a severe blow to the credibility and efficacy of a body that was supposed to improve on its discredited predecessor. It will be a black day for human rights,” said Hillel Neuer, executive director of the Geneva-based UN Watch. “The likely election of oppressive regimes will only send the message that politics trumps human rights, and will let down millions of victims worldwide who look to the world body for protection,” he added. A comprehensive report by UN Watch, to be released next week at the UN, shows these Council member states perpetrate gross and systematic human rights abuses, including massive violations of the freedoms of speech, press, religion, and assembly. They were also found to oppose UN resolutions speaking out for victims of human rights abuses in various countries, the NGO said in a statement Friday. “Despite the much-vaunted 2006 reform – which scrapped the discredited human rights commission and created a new and supposedly improved council — next week's likely election of major human rights abusers means that we are back to square one. Instead of reform, we have regression,” said Neuer. Despite the fact that the UNHRC is mandated to deal with issues related to “human rights”, it has a history of electing states with questionable human rights records. Saudi Arabia's envoy to the UNHRC was in September selected to head an influential panel on human rights, despite Riyadh's own poor track record for human rights issues. 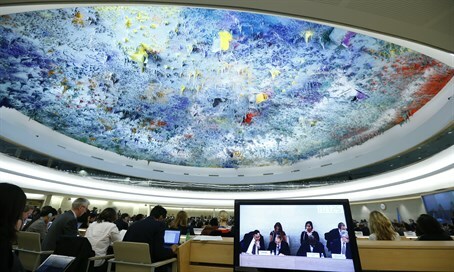 Saudi Arabia won its seat on the UN Human Rights Council in 2013, being one of several countries with questionable human rights records to win seats in this body at that time. Other countries included China, Russia, Algeria, Cuba, and Vietnam.